Help Kickstart a cool project out of Atlanta, Georgia. Missy and Kristin Koefod are trying to launch a company to sell bitters, shrubs, syrups, tinctures, tonics, and other cocktail mixers, and they need your help. With 4 days to go, they’re at $5,770 pledged toward their $7,500 goal. Please help them get over the top! My fellow cocktail bloggers have been working on shrubs and gastriques for a while now. I don’t know why I’ve held off until now. Lack of ambition, perhaps. But I came back from Tales with a drive to try it out, and I’ll credit that impetus entirely to the Cabana Shrub. Cabana Cachaça (link, NSFW) was a sponsor at Tales, and more specifically, Cabana sponsored both the Tales blog and the blogger meetup party at Tales. At the meetup party, Cabana served up two drinks: a traditional caipirinha and the Cabana Shrub. It’s fabulous–balanced and refreshing, with each ingredient present but not overweening. I could taste the cachaça, the fruit, and the tarty vinegar, but no single element predominated. I kept going back for more, to the point where I honestly lost count of how many I drank. In a long weekend with many fine drinks, this one was among my favorites. Technique: Build in a short ice-filled glass. Top with ginger ale. Add garnish. Technique: Bring ingredients to a boil. Stir. Reduce heat and simmer for 10 minutes. Strain into a glass bottle. When I tasted this drink, I had two reactions–Wow, this is good; and, Jen is going to love this. By the time I got home, raspberry season had ended in our part of New England, but blueberries and gooseberries were going strong. So over the weekend I cooked up some shrub syrup, using champagne vinegar and a mix of gooseberries and raspberries. I tinkered a bit with the recipe, in part because I had no ginger ale/beer ready. Recently, I set out to make another batch of dark simple syrup. My go-to sugar for this is normally Demerara raw cane sugar, but my local Whole Foods was out. I did, though, find both dark and light Muscovado. Both varieties are similar to brown sugar, but instead of adding molasses to refined white sugar, as in the case of brown sugar, processors of Muscovado boil down cane-sugar juice to make the sugar. I considered both but chose the dark. I knew from just looking at it in the package that it might be moister than most sugars, but I wasn’t sure how that would play out in the saucepan. So I took a chance on it. When I got it home, I set to it with scissors and was surprised to find that it was even moister than I expected. I sampled a bit out of the bag. The mouth feel was supple and the molasses flavor, rich, sweet, and rounded. Imagine a simple Domino dark-brown sugar. The Muscovado was similar, but richer, deeper, and more complex. It melted easily into simmering water, so I waited for it to cool and then I bottled it. The texture of the syrup was thick and smooth, and the flavor, very rich. I think it’s accurate to say this is a molasses syrup–more pourable than molasses, but thicker even than Demerara syrup. I’ve worked with it for a couple of weeks now, and I’m not sure I’m satisfied with it. Because of its thickness, it doesn’t mix well and I have to finesse it. If I simply put it in a glass or shaker with spirits, other ingredients, and ice, and then stir or shake, the ice chills the syrup and makes it too think to mix. The solution (ahem) is to put the syrup in first, slowly pour in an amount of spirit (an ounce or two), and then stir–without ice! !–until the syrup dissolves into the spirit. Then I can add my remaining ingredients and then shake or stir. To my palate, the Muscovado syrup seems a little strong for most ingredients. It works best with a punchy whiskey, like a bonded rye, so I’ve been saving it primarily for Old Fashioneds and other whiskey cocktails. It occurs to me, though, that I haven’t played with it in a daiquiri. With the right rum, that might be worth trying. For this month’s Mixology Monday, I decided to try something new–the Plum Royale. Anita’s post on the Rosemary Five got me thinking about pairing fruit and spice in a champagne drink. A day after I read her post, I had a Gin Royale at brunch and decided to riff on that. Finally, Jen brought home some beautiful black plums. So with three ingredients already in mind–gin, champagne, and plum–I had to find my spice. In Googling around to find inspiration, I came across an article about Plymouth gin that discussed, among other things, the botanicals in Plymouth–angelica root, cardamom pods, coriander seeds, lemon peel, orange peel, orris root, and juniper berries. Hm, cardamom. Turns out that cardamom and plums are a popular pairing, so I chose to go that way. I made up a variation on this Cardamom Lime Syrup, sans lime this time. I also made a plum puree. 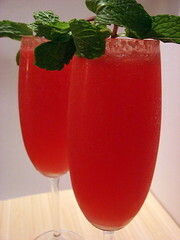 The puree, gin, and syrup formed the basis for the drink, which I topped with champagne. Inspired by this post, by Sam Kinsey on eGullet, I decided to make a lime syrup for gimlets. Jen and I both enjoy gimlets, but I haven’t made them in a long while because I wasn’t too crazy about the way I’ve made them. I’ve tried gin and Rose’s, but that’s too sweet and artificial tasting. I’ve tried gin and lime, but that’s way too bracing. Gin, lime, and simple syrup works well, but it’s not quite right either. I googled around for a bit and found a recipe at the BBC site, for a lime syrup to serve over pineapple. The recipe called for cardamom pods, which intrigued me because I thought the cardamom would play well with gin and lime. I tinkered just a bit with the proportions, and the next time I make it, I’ll definitely play around the ingredients–perhaps leaving out the water and doubling the lime juice, adding a couple of juniper berries with the cardamom, and so forth. Also, because this was formulated as a food syrup rather than a drinks syrup, the recipe didn’t advise me to strain the cardamom from the syrup. Jen and I don’t mind pod floaters in our drinks, but if I were serving these for company, I’d certainly want to strain out the herbs. I’m also trying to think about other applications of this syrup. It would go great with rum, for example, but I’m happy to hear other ideas. Put the superfine sugar, cardamom pods, lime juice, and water in a pan. Stir over a gentle heat until the sugar has dissolved. Take off the heat and allow to cool before adding the lime zest.